Sauber driver Pascal Wehrlein could miss the first Formula 1 pre-season test after suffering a neck injury. 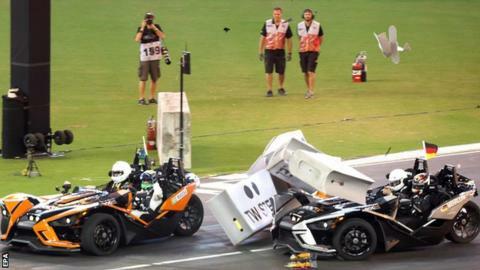 The 22-year-old German is in discomfort with a neck compression after he rolled a car at January's Race of Champions in Miami. Wehrlein, a Mercedes young driver who raced for Manor last year, will have a medical check-up at the end of next week to see if he is fit to drive. The first pre-season test is in Barcelona from 27 February to 2 March. Sauber described the possibility of Wehrlein missing some of the testing sessions as "speculation", adding that "medical examinations are ongoing". Wehrlein's seat at the Swiss team is being funded by Mercedes this year after the German company decided against promoting him from reserve driver to replace world champion Nico Rosberg, who retired at the end of last season. The seat alongside Lewis Hamilton went instead to former Williams driver Valtteri Bottas. Mercedes preferred the Finn's experience and consistency, feeling Wehrlein was not yet ready after just one year's experience for a move to a title-contending team. Will cockpit protection be ready?